Rajinikanth’s Petta, which released on January 10th, marking the Pongal holidays, has had a good run at the box office with packed shows. The Karthik Subbaraj directorial crosses 25 days today (February 3rd). The director took to Twitter to thank everyone who made this movie a huge success. He revealed that the Background Score of Petta will be officially released today. 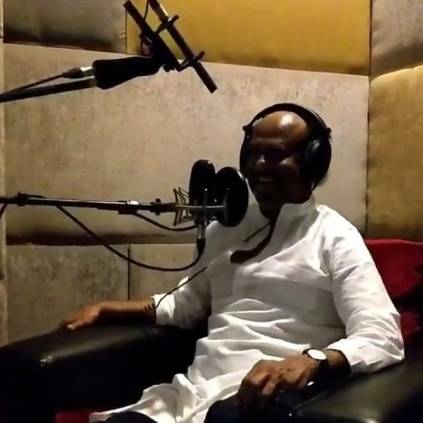 He also posted a video of Rajinikanth dubbing for the movie. The video features Rajinikanth rendering a fierce dialogue from the movie,along with his evil laugh. Indeed a treat for Thalaivar fans. Petta, also stars Vijay Sethupathi, Nawazuddin Siddiqui, Simran, Trisha, Bobby Simha, Sasikumar, Megha Akash and Sananth in crucial roles. It has music by Anirudh Ravichander and cinematography by S.Tirru. The project was bankrolled by Kalanithi Maran under the banner Sun Pictures.